So it's almost summer and the good "exotic" produce is probably showing up more and more in your local grocery store. Have you ever passed over the pineapple section and maybe even the table holding the ripe, delicious mango because you thought to yourself, " While that would be delicious, it's just too much of a hassle to prepare". Or maybe you just plain don't know how to cut them properly. Trust me, you are not alone! I think that Americans, in general, miss out on the abundance of nutrients in many foods because of a) the inconvenience or b) the unfamiliarity. I'm going to let you in on a little secret that will practically solve the problem of exhibit a. Aren't you excited?!? 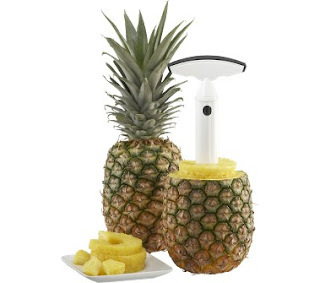 Pineapple slicer ~ I'm sure you've seen these in Crate and Barrel and though to yourself, "How in the world does that little thing slice a pineapple?". I'm here to tell you that it makes the task SO incredibly simple! I should tell you that my childhood was spent living in Hawaii and I have had my fair share of pineapple in my life, but I have never enjoyed it as much as I do now that it literally takes me 30 seconds to cut. It comes out in the perfect round slices and you have the entire shell of the fruit left to use as cute presentation for salsas and dips! How great is that? 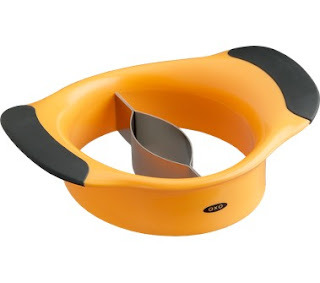 Mango pitter ~ This little tool is also a big time saver. It allows you to remove the seed while taking none of the precious fleshy fruit with it! You may think these things look silly, but trust me, I am much more likely to include these yummy tropical fruits into our diet with these time saving gadgets. My husband definitely appreciates having more of these savory treats in his lunch during the summer months! Next time you're at the farmer's market or at the grocery store, try to pick up at least one thing you've never tried before. Google a recipe with that ingredient and try something new! It is so important to vary your diet with an array of fruits and vegetables! Also try to focus on what's in season (it always tastes better!). Check out this link to find out what's in season in your region.